Need to fill out lots of paperwork? 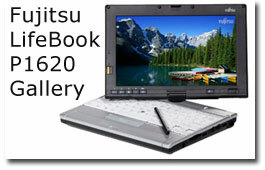 Ditch your clipboard and zip through forms using the Fujitsu LifeBookÂ® P1620. Want to type an email or prepare a presentation? Simply flip the screen to transform the system into a notebook. The ultra-portable LifeBook P1620 notebook combines the familiarity of a notebook with the versatility of a tablet. Other Software: EverNoteÂ® Plus, DialKeys, Fujitsu ShockSensor Utility, Fujitsu Portshutter, Fujitsu HotKey Utility, Norton Internet Security 2007 (90-Day Trial1), LifeBook Security/Application Panel, Fujitsu Driver Update Utility, Intellisonic Audio Utility, TPM Utility CD, OmniPass Fingerprint Authentication Utility, Microsoft OneNoteÂ® 2007 maybe optional on some systems. Warranty: One- or three-year International Limited Warranty on select corporate configurations; 24/7 technical support; Fujitsu extended service plans available.